P. J. Sparkles is a 1992 animated television special produced by Mike Young Productions. The special was more-or-less an advertising vehicle for a Mattel doll. Jodi Benson, best known for voicing Ariel in Disney’s The Little Mermaid franchise, voiced the title character. The P.J. 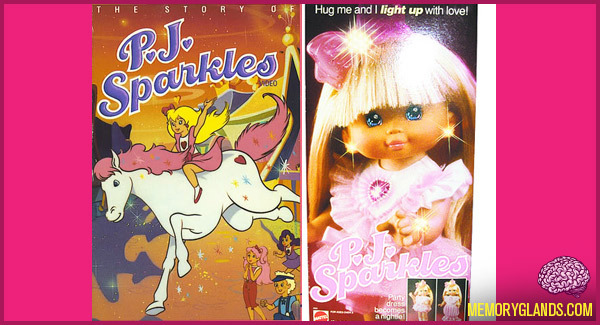 Sparkles doll came with an animated movie in which a young orphan girl named P.J. living in Mrs. Omally’s Orphanage rides out one night on the orphanage’s withered old horse Blaze. Every time P.J. makes a friend, they’re adopted and P.J. finds herself alone again, so she goes out to wish on a star for someone to love her. P.J. soon finds herself in Twinkle Town, a small village full of nameless children who have also been wishing for a leader to love and guide them. Also, Blaze’s appearance has changed and he can talk. P.J. takes on the last name Sparkles, gives the children of Twinkle Town names, and becomes their leader. However, the neighbors, The Cloak and his wife Betty are displeased with the color and bright light that P.J. has brought to the town, and try to sabotage her efforts.